Zoosk - Reviews, Cost, all the informations about Zoosk! See 2 opinions about Zoosk. Launched in 2007 Zoosk.com is a dating site which owes its strong growth to social networks like Facebook, Bebo, Hi5 and MySpace. It also offers for some years applications for Android, Apple iOS and Amazon. Well designed, Zoosk allows millions of singles nearly to the place where you live to get in touch and why not, find the soul mate. Thanks to a rapid success, Zoosk has built a community of 50 million members (called Zooskeurs) across more than 40 countries in the world. Zoosk is a site where registration and profile viewing are free but also allows its members to buy premium options to offer virtual gifts (to show interest) or to subscribe to a premium subscription to respond to a private message. Zoosk subscription prices are average for dating sites. Since 2007 Zoosk has been able to gather a large number of serious members and its design makes navigation and search profiles very simple. Moreover most profiles are active and it is therefore easy and fast to contact another Zooskeur. 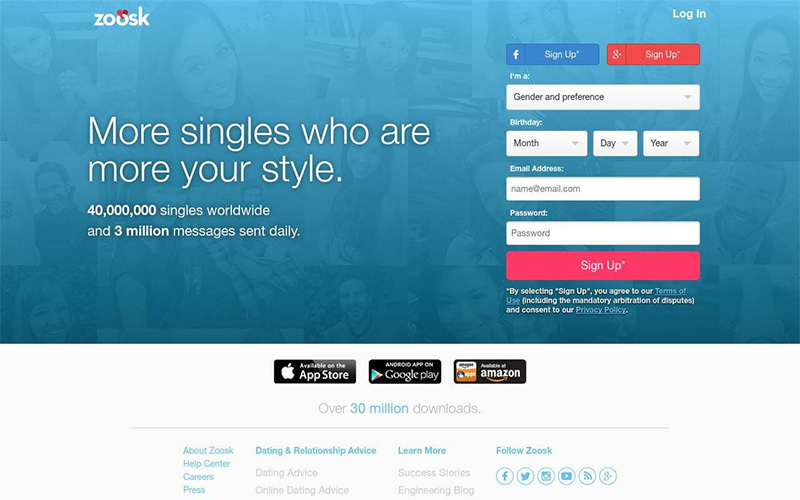 However since the boom of the launch thanks to the social networks, many members have deserted this dating site. Zoosk seems to be more successful in Canada than in USA. In addition to leaving a comment below, you can give a rating to Zoosk by giving it stars. You will help other users. Hi ! I tried zoosk for 3 months. At first satisfied, I am today rather disappointed of Zoosk. I can not make a qualitative dating. I’m thinking of trying another dating site. Zoosk is a sh*t dating site ! I want to leave zoosk ? How to cancel zoosk suscription ? Thanks !